The Wallace Foundation Learning and Outreach Center located near Lewis, Iowa houses the offices of the Wallace Foundation for Rural Research and Development, the offices for ISU Extension Region 17, Tri County Steer Carcass Futurity and the ISU Armstrong Research Farm. What's going on at the Armstrong Research Farm this month? We were able to cover a lot of ground this past week with 4 good days of running. Armstrong received .56 of an inch of rain and Neely-Kinyon received .96 of an inch for the week. We received .2 of rain over night, so may be tomorrow before back in the field. We continue making good progress here in southwest Iowa. Still busy with some planting, spraying, etc. this past week. The was no precipitation recorded at Armstrong this past week, however Neely-Kinyon received .45 of an inch. 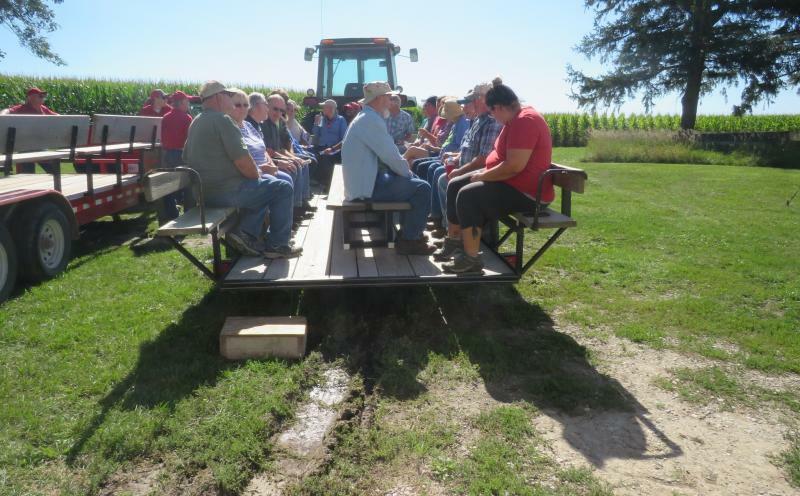 This past week we had 8 Extension people from Kansas State University stop in to visit and tour the Armstrong Farm. We talked about how Extension and Outreach and the Research Farm are housed and work together here and several of the research trials that are currently being done here. Also this past weekend, there were two graduation receptions held here at the Learning Center. Congratulations to all who graduated from the area this year! Rain fall at Armstrong farm 2.43 inches and Neely-Kinyon farm 1.86, good moisture and much needed. Crops are looking pretty good consideing the dry May, along with the heat and wind that has occurred over the past few weeks. Final preperation are underway for field day at Neely-Kenyon. Mike Witt and Aaron Seaugling are setting up the program for June19th. Crops are really starting to change and take off. The Armstrong Farm received 1.01 inches of precipitaion over the week and Neely-Kinyon received 1.39 inches. The rain is much apprecated and came in good fashion in our area. Activities: 1.) Randy continues to monitor the demo garden - really lookings good 2.) Jim and John contiune to srpay plots etc, on the farm 3.) part of the sorghum at Neely-Kinyon farm was planted-then equipement breakdown and rain came 4.) Hay was raked, baled and hailed in 5.) 3 loads of grain were hauled to town 6.) Tim Youngquist came to Neely-Kinyon to spot spray thistles on STRIPS project 7.) John got N X Timing sidedressing done 8.) Jim put in cover crops on demo for On Farm project at Armstrong. We are making final preperation for Neely-Kinyon Field day on June 19. Making final preparation for harvesting McNay bull at the end of the week. The rain was welcome, but would like a few drying days so we can finish planting the Bayer trial and also the corn rootworm study. Then the planters can finally be put away for the year. Temps in the 90's Friday thru the weekend. Armstrong had 1.45 inches of rain and Neely-Kinyon .64 of and inch. Activities: 1.) John and Jim are working on equip, sidedress machine and planters 2.) Mowed thistles in monarch plots 3.) Randy took sale item to Ames for acution 4.) John sprayed plots when conditions were suitable 5.) FACTS cron was sidedressed 6.) Sorghum was planted at NK 7.) Corn rootworm trial planted 8.) Bayer trial planted 9.) Weighted FIMS bulls Friday and Saturday-56 head to Tyson forslaugher Saturday Morning 10.) 4 head for McNay herb bulls 11.) Final cleanup done at NK farm for field day on Tuesday. Planting is all completted. Spraying will continue when weather allows. A special thanks to all who help with the field day at the NK farm. Special thanks to our speakers Mike Witt, Tim Youngquist and Randall Cass. Please contact us if you have any questions. Dallas will be out of town, but he is leaving the farms in good capable hands. Temps are still cooler for this time of year, which has been a good thing since we are about 2 inches below normal rainfall. Armstrong has received .52 of an inch of precipation since the 8th of this month and MK .88 for the same time period. The Soybean harvest stated 9/18/18 here at the farm. Been able to run only parts of 4 days since we started. Durning Sept Armstrong has had 6.14 inches and N/K Farm 10.08 inches of precipitaion. We have been preparing for harvest and calibrating machinery so its ready to run when the ground is fit. The cattle hoop building is in the construction process, I-beams and trusses have been installed. just wainting for an ideal day so the crew can install the cover and finish up. Still looking for a construction outfit to pour a cement wall on the west end of the building. FFA District Soil Judging Contest was held at the Armstrong facility, 131 FFA members from Southwest Iowa attened this activity. This included 23 schools, also in attendance were advisors, District Officers, Farm Bureau members served lunch and the NRCS had a soil erosion display. Neely-Kinyon farm hosted the Adair county 3rd graders for an "Ag For All" field day. Those attending this event were 3 Adair County school districts classroom, their teacher and aids. We received some wonderful response from those attending, except for the weather, it was a damp and cool day. Plans moving forward are to switch to combing corn so we are ready when conditions are favorable. Hoping for a window to get fields open up and combine set. Research plots have yet to be harvested. They are looking like they are ready to go when it's fit. Happy and Safe Harvest Season to EVERYONE!! Switched over to corn, conditions not suitable soybean harvest. Opened up some areas and ran about 2 days. Harvested long term nitrogen study, one of Jim's On Farm trials. Will focus on research projects as soon as it is fit to harvest. Please contact John Beckman or myself if you have any questions or concerns about this years harvest. We plan posting trial harvest date a few days before as we see it fit to run again. Hope you all have a good week and GO CYCLONES!!! The combine only ran a few hours this past week. We continue to check our equipment to make sure it is field ready when conditions are fit. We are currently making hervest rows and taking stand counts on projects. We will keep you updated on progress here on both farms, knowing there is some sampling, tillage, etc. that needs to be done yet this fall. ﻿October 17, 2018 - Back in the field-on top of the hills- working on corn trials. Harvested the following: KX Tillage, PX Tillage, NX Tillage, long term Tillage and Learning Farm cover crop. October 18, 2018 - Harvested the following: 7N-Trial, Date of Planting and FACTS. October 22, 2018 - We had a good week of harvest, Cardinal trial and one of Jim's On Farm cover crop study was harvested on Friday. Switching to soybeans. Other activities: Hauled manure, bulk beans at N/K was harvested, LTAR beans were started but came to a hault due to combine issues, Herbicide trial crew came to cut their alleyways, STRIPS crew set up rain simulation on STRIPS program, and began plans for the arrival of the McNay cattle to arrive in a few weeks. October 24, 2018 - Weather has been good for farm work but they are talking rain in the near future. 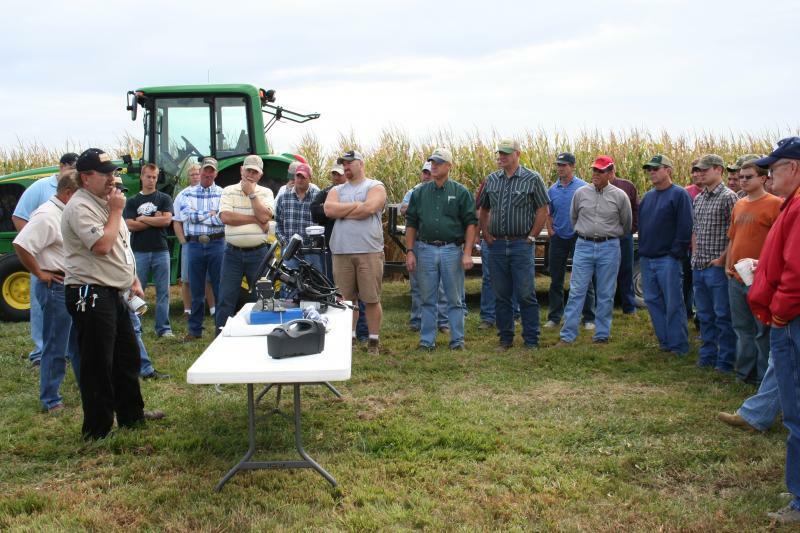 Soybean harvest is as follows: Finished STRIPS bowls at Armstrong, NX Tillage trial, Learning Farm Cover Crop, Herbicide Trail, LTAR soybean plots and On Farm soybean demo at Neely-Kinyon. STRIPS crew will start their rain simulator study project today. The cover on the cattle building was put up, there are still a few finishing touches to be done. Hope your harvest is going well. Have a good day! AND GO CYCLONES! ﻿WA﻿﻿NT THE OPPORTUNITY TO BE PART OF A RESEARCH TEAM? Th﻿e Wallace Foundation intends to establish teams to identify research/e﻿ducation needs in southwest Iowa and propose projects to be conducted at the Armstrong Research Farm, the Neely-Kinyon Research Farm, or on private farms in the Wallace Foundation southwest Iowa area. Eligible projects must be consistent with the Wallace Foundation mission: To provide a framework for local people to accelerate agricultural research, technology transfer, and rural development in southwest Iowa. Proposed team focal areas include: fruits and vegetables; crops and soils; livestock; niche markets, farm business management, and local foods; and, resources, membership and youth involvement in the Wallace Foundation. Applications for participation on a team will be received through calendar year 2018. If interested, contact the Wallace Foundation, 53020 Hitchcock Avenue, Lewis, IA 51544. Need a Unique Location For Your Next Meeting or Event? For your next business meeting or event in Southwest Iowa, consider the Wallace Foundation Learning Center. Meeting attendees will be near hotels and restaurants in Atlantic, Griswold, Walnut or Council Bluffs. Local catering services are also available. For more information or to reserve a meeting space, please contact RaeLyn Barkley (raelynb@iastate.edu) or phone 712-769-2650. The Wallace Foundation Learning Center can be divided into three separate rooms to accommodate small-to-medium sized groups. Separated by rolling floor-to-ceiling wall panels, these dividers can be easily moved to create an ideal meeting space for breakout sessions or small work teams. When closed, the dividers ensure complete privacy. You can rent all conference rooms or select the room that best meets your needs. The three meeting rooms include tables and chairs that can accommodate up to 25 people each. With the wall panels open, seating is available for up to 150. Conference Room 1 is conveniently located next to the kitchen facilities. Kitchen facilities may also be reserved with any conference room rental. Kitchen facilities include use of the refrigerator, coffee maker, utensils and cookware.